Test automation can bring many benefits to your mobile app testing cycles, allowing you to build better apps with less effort. It is less time consuming as well! Many companies still run only manual tests because they don’t know how to properly integrate automated testing in their app development process. Keep on reading to find out the top benefits of automated testing! Automated testing means that a machine does, what a human used to do, quicker, with less errors, 24/7. Does it sound familiar? Well, you’re totally right, it does sound familiar. Remember the assembly line introduced during the industrial revolution? Then, machines started to take over all of the repetitive and boring tasks. Humans quickly tend to lose concentration with that kind of work or to overlook things that weren’t right. Machines are more reliable and faster in this. There’s also an obvious big starting investment when introducing change, especially this kind of change. Usually the smaller companies are afraid that the returns won’t be as expected or if there will be a ROI at all. Back then people needed this kind of automation to produce the exact same parts that match perfectly with other parts so that the assembly could be done in less time and thus enhancing the production. You’re not sure you need test automation? This analogy doesn’t convince you? Well, let’s have a closer look at the 10 top benefits of automated testing. Let’s start from the beginning: the big initial investment. This may be a hold back for many, but it is proven that the return of that investment is a long-term one and it will also save time. No matter where you are in the world. You can start the tests when you leave the office and when you get back in the morning you can see the results and keep on working. You can even do that remotely if you don’t have a lot of devices or you don’t have the possibility to buy them. You don’t need a lot of people: you would need a test automation engineer to write your scripts to automate your tests, instead of a lot of people doing boring manual tests over and over again. Automation helps you find bugs in the early stages of software development, reducing expenses and working hours to fix these problems as well. Automated testing is more reliable and way quicker when running boring repetitive standardized tests which can not be skipped, ever, but may cause errors when manually tested. You can test more devices simultaneously resulting in comparative detailed reports generated in less time with the exact the same parameters, because the exact same scripts were run. 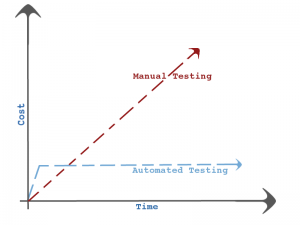 Automated testing helps testers, such as automation engineers. They can see exactly what other engineers have done, what scripts he has already written and what tests have already been performed and what bugs were already found and fixed, through clear reports. One of the these methods is the stress test in which the capacities of the application and operational infrastructure will be tested to it’s limits with stress test, which can’t be done manually. Automated testing allows to run tests on thousands of mobile devices (more then 18000 devices). Testing all of them manually would be impossible! In the end you will have a better quality software which will be released earlier, with less problems and you have used less resources. As largely know, there is usually always a downside to everything. So there are downsides to automated testing as well. There are a few things that automated testing won’t do: it won’t fix specific problems that users might have. When writing and testing the scripts there are just some scenarios that are being tested, not all of them. The main purpose of automated testing is to find bugs in simple operations, e.g. to log into the app, create a new account or send email when the password gets forgotten. That’s what automated tests do. App crashes in specific scenarios must still be tested manually. As we know, machines are very advanced, but they are not smart, (yet!). One other thing that automated testing won’t do is test the effective usability of the design, e.g. where the buttons are positioned, and how easy it is to actually use the app. That still has to be done by manual user-friendly tests. In conclusion there are benefits and drawbacks to both automated and manual testing. This article had the purpose to show how automated testing can help you to make your testing more efficient. To achieve the best results you will need a combination of both types: automated testing for repetitive, simple use-cases; and manual testing for reproducing specific bugs, complicated use cases and to ensure the best user experience possible. Through the solutions that we offer, we are positive that we can help you find one that satisfies your needs. With our Kickstart program we provide you with an experienced testing engineer who will work with you to develop a suitable automation strategy, and implement the test scripts for you. Your employees will be involved through hands-on training for test automation. At the end of the kickstart project, your testing team can develop the automation further on their own, and apply it to new testing situations. More on test automation and mobile app testing: “Test Automation – Best Practices”; “What to Test When Testing a Mobile App”.